So the past week has seen me start from scratch meshing my gear in Abaqus. We decided to cut the tooth in half so that there would be less computing power needed and we could apply a symmetric boundary condition so that we could replicate an entire tooth. So after hours of very annoyingly finding error and more errors in the mesh I finally meshed the whole thing with no errors! I had to use several different techniques such as partitioning the part into five separate cells which was not trivial because if any cell had too obtuse or too acute angles the resulting elements would results in errors. I started by meshing the cell at the root of the tooth. I then had to partition some of the faces around the root of the tooth because trying to mesh that area as a swept hex mesh was giving distorted element shapes but after some simple partitioning the elements came out more uniform. I then meshed the area behind the root of the tooth using a bottom up hex mesh which only today have I mastered. Then I meshed the flank of the tooth using a swept hex mesh. Then I meshed the top land and core of the tooth using bottom up hex meshing again. Finally I meshed the flange of the gear using a swept hex mesh on a single cell so that is why there are some non-uniform shapes but it gave me no error or even warnings so I'm quite content to leave that as it is. 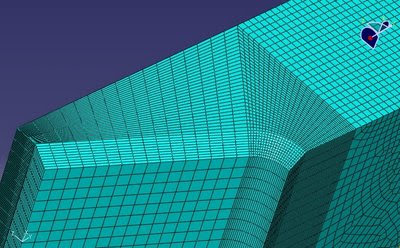 how do you know that this meshing will give you the good results?